Middle-grade fans of post apocalyptic fiction are in for a treat with this fanciful and engaging animal story by the author of the Clockwork Dark trilogy. This is one author who has that magical touch that allows his animals to become somewhat human. 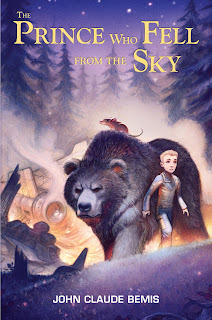 In a world where the humans are supposedly extinct, a bear and rat find themselves protecting a child who fell from the sky. When a flying craft crashes in the forest, Dumpster, a rat and Casseomae find themselves the protector of the only survivor, a young boy. The animals of the forest call humans the “skinless ones”. As you read you realize they have many prejudices against humans based on what they have heard from tales passed down. I thought it interesting that Dumpster was the keeper of the memories. He is despised by others in the forest because he lived among the humans. Dogs are even lower on the list because they lived with the humans. I loved the writing style. Bemis did not tell the names of animals. He described them through the eyes of the band of animals traveling together. When Casseomae comes upon her first strange animal she described it as a “strange deer. It had an exceptionally long neck ….she could make out spots over its coat, large brown blots against a field of tawny yellow.” (Page 193) It would have been so much easier to just say they saw the carcass of a dead giraffe. His descriptions showed the animals as intelligent but not all knowing. I had not read his previous trilogy The Clockwork Dark, but will definitely do so now. This is an author I will proudly recommend to all of my students and parents. Come back tomorrow for a guest post from the Author. I talk with someone about it. I deal with bad situations by taking a deep breath and get more information. I try to just be calm about whatever the situation is. I take a deep breath and count to ten. If it's nothing I can change I learn to accept it. If something can be done to make things better, then I do that.